The Kramer UTBUS-1xl-KIT is an under table AV mounted box perfect for your conference room table when you don't want to cut into your table top. Ideal for permanent or temporary installations when you need direct access to your connections under a desk surface. This solution is an extremely simple, affordable and elegant multiple connection boardroom solution that can be moved if needed without leaving a hole in your table. 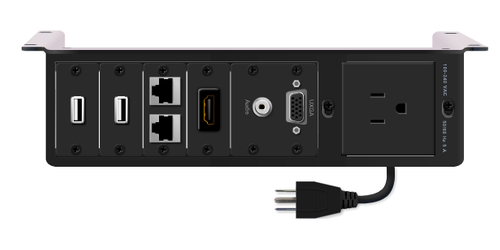 The kit includes 2 USB A-A, 2 RJ45 F-F, 1 HDMI F-F, VGA and audio F-F, and US power with 6' cable. All connections are female to female for easy plug and play from the backside. Dimensions (WDH): 9.84" x 5.41" x 2.56"